On April 9, 55 athletes from across the globe faced snow, ice, and sub-zero temperatures as they attempted the northernmost (and arguably chilliest) marathon on Earth: the North Pole Marathon. A "destination marathon" to the extreme, the North Pole Marathon is run atop the Arctic Ocean; runners have 6- to 12-foot-thick ice sheets separating their feet from frigid polar waters. The circular course, which starts at a drifting North Pole camp named Barneo, is repeated about 10 times to make up 26.2 miles, according to the North Pole Marathon website. Given this race isn’t actually on land, the entire course moves slightly with the ocean current while the event takes place—but runners don’t feel the movement (just the freezing cold air). The marathon’s highly anticipated finish line lies at the true "North Pole," where all longitudinal lines meet. To an adventure junkie, this marathon sounds like a dream. For a non-runner, attempting 26.2 miles on the North Pole sounds suicidal. 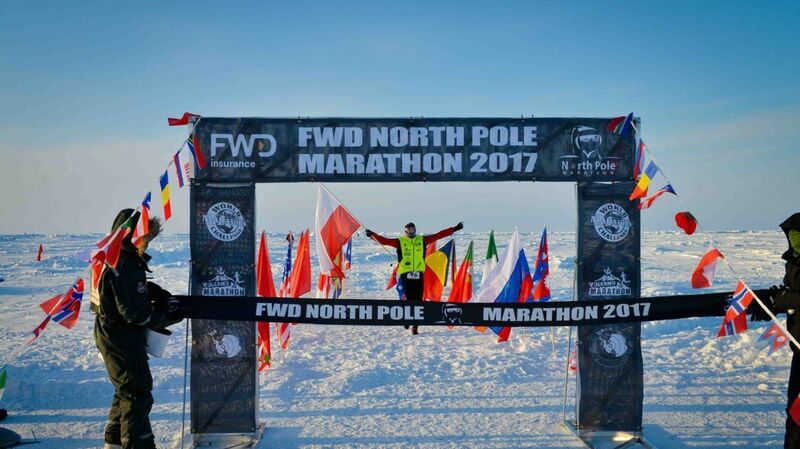 Shilpa Abbitt, an oil and gas evaluation engineer who completed the North Pole Marathon last year, tells why she signed up for the once-in-a-lifetime experience. "I’ve always thought about going to the North Pole," Abbitt tells mental_floss, "and the marathon helped me justify the expense of getting there." Shilpa Abbitt at the finish line of the North Pole Marathon in 2016. Photo courtesy of Shilpa Abbitt. Organized by experiential running group Global Running Adventures (which also produces other extreme marathon experiences like the World Marathon Challenge, where runners complete seven marathons in seven days across seven continents), the North Pole Marathon is in its 15th year and has seen more than 400 finishers from nearly 50 countries. (The 2005 event was cancelled "due to a dispute between French and Russian logistics operators.") The inaugural race was completed in 2002 by expert runner Richard Donovan of Ireland, who finished the 26.2-mile arctic run entirely by himself—in 3:48:12. For context, the average men’s marathon time (in non-polar, normal conditions) is 4:19:27. This year's winners, Piotr Suchenia of Poland and Frederique Laurent of France finished in 4:06:34 and 6:21.03, respectively. Donovan now serves as the marathon’s race director, where his focus is not only running a seamless event—but getting people safely to and from the North Pole. "The task of actually getting to Camp Barneo is a marathon within itself," says Abbitt, whose race was delayed one week due to cracks in the ice that stopped planes from landing. "Donovan ensured we were safe and kept his cool despite all that was thrown at him. Honestly, when you’re going to extreme places like the North Pole, you have to go in with a good attitude—don’t stress about delays and be flexible." Since its inception, the North Pole Marathon has seen all sorts of runners, including CEOs, magazine editors, novelists, Ironman athletes, and first-time marathoners. The women’s record (4:52:45) was set by Anne-Marie Flammersfeld of Germany in 2014, and Thomas Maguire of Ireland set the men’s record (3:36:10) in 2007. But most runners don’t come here to break records. They come for the experience and, in many cases, to raise money for charity. Abbitt’s cause was one of the most personal. She started the Big A Charitable Fund through the Oklahoma City Community Foundation in memory of her son, Austin, who died in 2002 at age 11 after an eight-year battle with brain cancer. She runs races like the North Pole Marathon to cope with the loss and to raise money for cancer research; she’s running 17 marathons in 2017 to continue fundraising. While Abbitt is an experienced marathoner (she’s completed more than 100 of them), the North Pole Marathon is open to any runner who can afford the $17,000+ entry fee. Of course, a typical 14- to 20-week marathon training plan (what’s required for any 26.2 race) is recommended. "Anyone can run the North Pole Marathon as long as expectations align with the training regimen," Abbitt says. "Expert runners will need specific training to excel and break records, but if you just go out there to run and get the experience, you can finish this race." To cross the North Pole finish line in one, frostbite-free piece, runners need warm gear. Wind chill temperatures typically run about -22° Fahrenheit, so race organizers recommend multiple layers, toe and foot warmers, and ski goggles. Abbitt also suggests multiple pairs of mittens, face masks, and windproof gloves. What else should runners know before dropping nearly $20,000 on these extreme running conditions? Polar bears are rarely a threat, wind chills have reached as low as almost -150° Fahrenheit, and if the race course "cracks," directors will re-route. And, perhaps the most pressing question, what does it actually feel like to run a race on the North Pole? "The North Pole racing experience is best described as running in sand in full scuba gear," Abbitt says. "It was weird, but Donovan built the course so we could experience different types of terrain like rough ice, slushy snow, and deep, loose snow that came up to our shins and knees." Ready to reserve your spot for 2018? Registration is now open, and we'd recommend traveling as far north as possible for long training runs next winter.